So this is officially my first post of the year two o sixteen (2016, yes you gotta pronounce it that way)! This range was launched last year (umm, maybe 6-7 months ago, don’t remember the exact date, they landed in July I guess) and I was pretty excited to try it when I read the word- satin on the foundation (I mean who wouldn’t be when you got dry skin? I happened to buy all the new releases that were launched in the month of June, July and August but couldn’t review any of them coz I didn’t feel like blogging, yeah that’s the only reason I could think of as of now (I didn’t blog all this while coz of sheer laziness , yes you can blame me for that, I’ve turned into a lazy bum) and the other reason is that I’m asking my hubby to get me a new dslr as I want to take my photography to a next level for the blog, so this was just to blackmail him that either get me a new dslr or I won’t blog at all and yes he’d be getting me a new dslr pretty soon (okay not him, my in laws are getting me one :D)!! So watch out this space for more interesting posts and photos. Now coming back to what we are off to in this post (the dreamy satiny skin), do I even need to describe the packaging? I guess it’s pretty clear from the pic but would just like to add here that the pump dispenser and the see through bottle of the foundation has made my life so much easier (not that my life revolves only around this foundi ) but whenever I’m in a hurry like in a very hurry (now that I’m a mom) and hubby says to get dressed up in just 10 minutes and I know I still have to use so many products to look my best (well, ya every blogger does it, I’m not guilty in charge), I reach for this foundation as I can just pick it, pump it up, spread it on and voilà I’m good to go with a good satin finish (no, I’d call it semi-matte perhaps)! Sometimes I don’t even use a concealer when I’m heading to a local market or a nearby place with this foundation but other times I have to use a concealer as it doesn’t cover up all those imperfections perfectly! Let me just put what you all are looking for in this post in simple words..
Coverage: Light to medium and gives an illusion of almost covered imperfections (covers redness and uneven areas quite well, those with heavy dark circles and blemishes will have to use a concealer)! Finish: I’d call it semi-matte, it feels satiny while applying but settles to a semi-matte finish but thankfully it doesn’t cling to the dry areas of my face neither feels cakey or patchy! I feel I’d be using it more often in winters when I need something that feels light on skin and doesn’t cling to the dry patches of my face, I’d call it a perfect daily wear foundation! Consistency: More on the thicker side like a cream foundation but blends perfectly on a well moisturized skin, it can be a lil hard to blend on dry skin so make sure your skin is well moisturized! Longevity: It lasts for about 3-4 hours on my skin by the end of which it starts fading from under my eyes, corner of my lips and also makes my pimple visible if I’m having any (yes, I don’t get pimples anymore, maybe one or two occasionally when I forget to remove my makeup) if it’s not covered with a concealer separately. 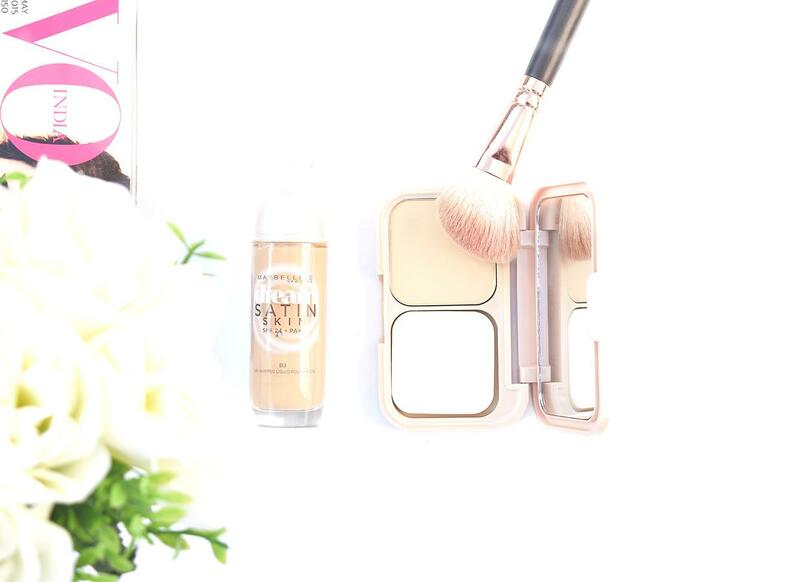 It’s my go to compact these days, I love its soft and smooth texture which is what makes me reach for it often! 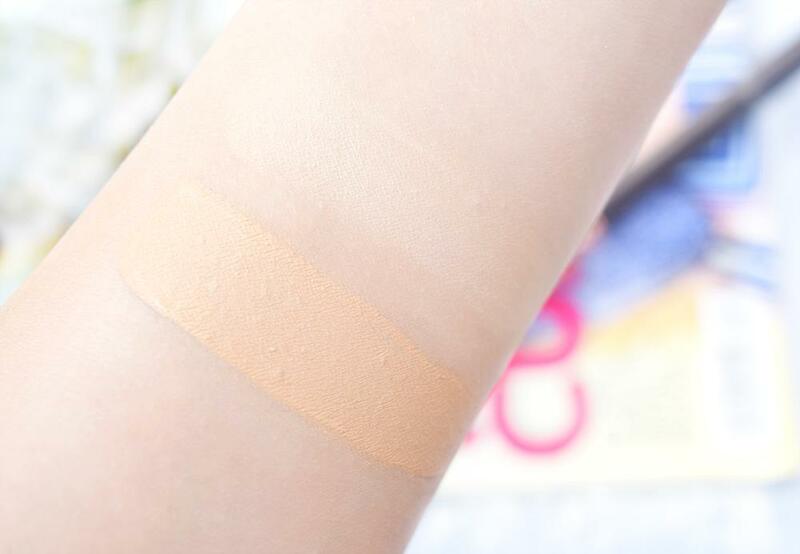 Coverage: Medium, pretty much good to cover minor imperfections! Texture: Soft and creamy, doesn’t feel chalky at all! Shade: There are around 6 shades in this range same as the foundation and my shade is B2 which is again a perfect match for my skin tone! The shade range is limited for darker skin tones as even the darkest shade looks so pale, boo ya on this, I don’t know why brands don’t bring much shades to India knowing the fact that India is the only country with maximum number of skin tones ranging from fair to darker skinned ladies, I mean where would dark-skinned beauties go to get their base? It’s high time for brands to up their strategy of bringing just 6-7 shades to India keeping 12-13 shades for US, hello there #Maybelline I hope you are listening! Longevity: Same as the foundation, lasts for around 3-4 hours!! Finish: Now this one has a satin finish when used dry, I haven’t tried using it wet tho! It doesn’t get patchy or cakey, I love using this compact in winters too when my skin feels extremely dry but still I want to touchup my base with a powder (you know the delights of a powergirl oops no, of a beauty addict ;) )! Anything more I’d like to say? Umm, I feel this range is good enough for daily wear when you want something that feels light and looks breathable and you also want some coverage from your makeup (and protection too in the form of spf), this range would be perfect for those days saving you up on time as it blends and applies easily! You can go like- apply a moisturizer, a sunscreen, the foundation with your hands (it blends well even with hands unlike most foundations which doesn’t blend up well with fingers), concealer if you want one and finally the compact (use it with a powder brush as it doesn’t apply well with the sponge provided with it) and you are good to go!! Edited to add: Oily skin can get oily in a few hours so you’ll have to touch up your base every 2 hours unlike someone with dry skin like me who can go without touching up for 3-4 hours, I feel this range is more suitable for dry skin but oily skin can use it as well, just that you have to touch up your base often with the powder! Have you gone the dream-y satin-y way with this range? Nice post Dr… after long gap…..
Hey welcome back! Happy New Year! Next Next post: Spice Up Your Lips With Maybelline Spiced Up Baby Lips!